Let’s just take a moment to let the words in the title of this post sink in. Yes, that’s right. Double chocolate. Nutella-stuffed. Cookies. Just imagine the taste and texture against the tip of your tongue as you bite into one. Imagine the creamy Nutella sticking to the roof of your mouth as you chew on the soft outer cookie layer. Mmmm. Truth be told, I’ve been itching to share this recipe ever since I created it earlier in the summer. But things got a little hectic. I started house hunting, bought a house, sold a house, photographed a couple of cookbooks, started working on the DIY Vegan book launch, and then packed up to move. And that’s just in the last few months. Do you want to know what the most difficult thing about the whole move was? Packing up my cookbook collection. In preparation for putting my house up for sale, we were advised to de-clutter as much as possible and move out any valuables. The first thing I thought of was my cookbook collection (Am I crazy?) since it is totally invaluable to me and also took up a large chunk of my dining room. So I begrudgingly packed all my books away and stored them at a friend’s house. Last week, I got them back. I’m not sure anyone around me quite understood how amazing it felt to rip open the boxes and line up the cookbooks on my new built-in bookshelf—carefully organized by size, necessity and favourites. It was like giving big, comforting hugs to friends I hadn’t seen in a while. I hinted back in September that we were hunting for a new house in the city. Today, I’m happy to report my cookbooks, cats and husband are all pretty thrilled that the move is over and we’re settling in exactly where we wanted to be. 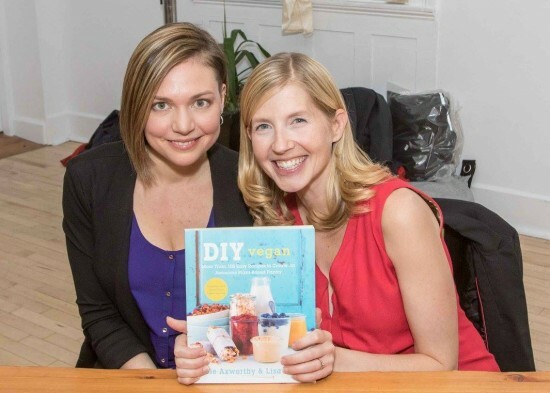 And, as if things couldn’t get any better, I’ve been over the moon about the amazing reviews and outpouring of support that Lisa and I have received since the release of DIY Vegan. Thank you to everyone who has picked up a copy and shared your thoughts on the book! 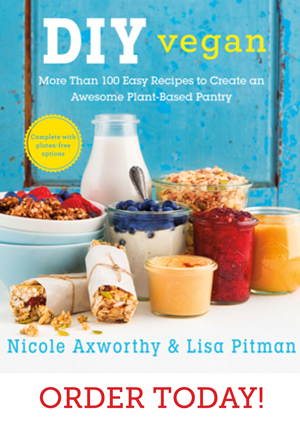 If you’re interested in checking out the reviews to see what people are saying and get a preview of the recipes, visit the sites of Dreena, JL, Dianne, Janet, Angela, Alisa, Natalie, Heather, Amanda, Heather, Kristina, Amey, Fran, Jessica, Andrea, Cadry, and Jackie… and there are still more to come! 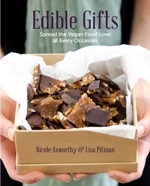 Personally—and I may be a bit bias here!—I think one of the best things about DIY Vegan is that the staple recipes can be used as the base for so many new creations. 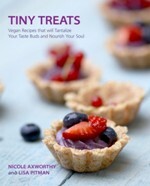 Over the last few months I’ve started using the book recipes to create brand new delights. 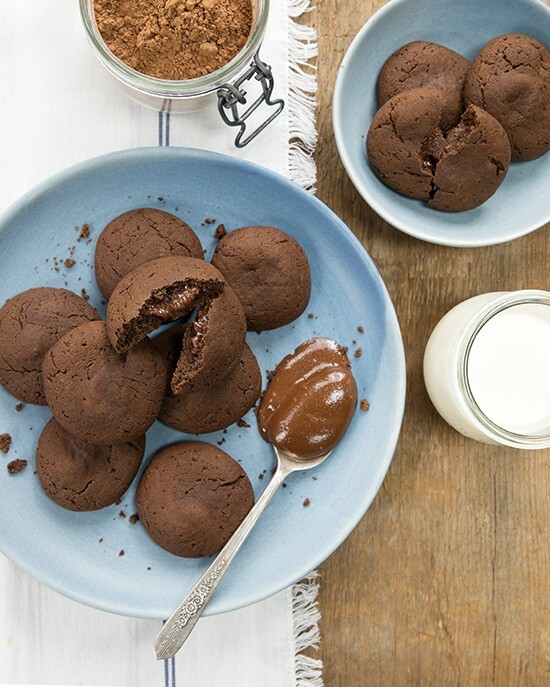 These Double Chocolate Nutella-Stuffed Cookies are just one example. 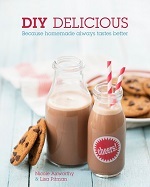 It all started with the Chocolate Hazelnut Butter from page 109. In my weaker moments during recipe development, I would eat it by the spoonful. 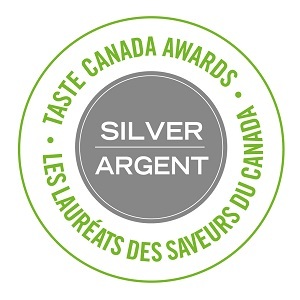 It was really meant for something greater, like a smooth, decadent centre for cookies, a little something to surprise those who would bite into them. So here they are, just for you. Just a quick reminder before I go: Our big GIVEAWAY for a Blendtec blender and Breville food processor is ending very soon. Be sure to enter while you can! 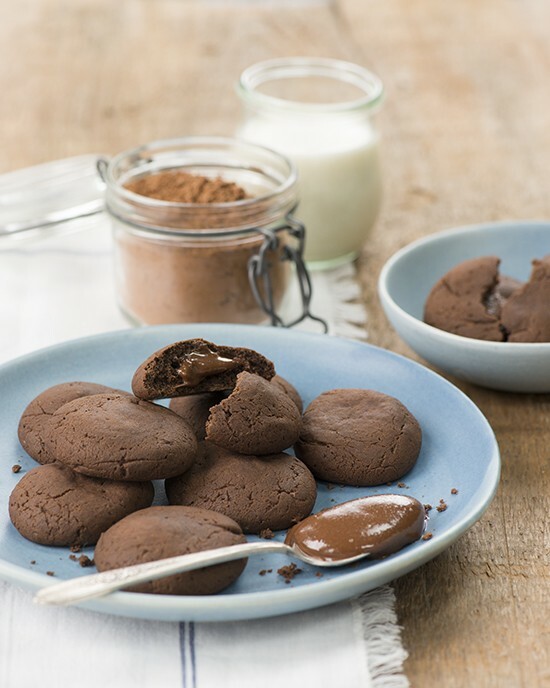 To make the Nutella centres, stir together the Chocolate Hazelnut Butter and 1 tablespoon cocoa powder in a small bowl until smooth. Scoop level teaspoons of the mixture onto the prepared cookie sheet (you should get 12 mounds in total). Place in the freezer to firm up while you make the cookie dough. 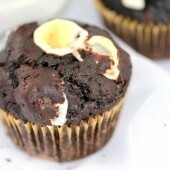 In a medium bowl, whisk together the remaining cocoa powder, the all-purpose flour, baking soda and sea salt. In another bowl, combine the coconut sugar, coconut oil, maple syrup, nondairy milk and vanilla and whisk vigorously until smooth and glossy. Add the dry ingredients to the bowl with the liquid mixture and use a spatula or wooden spoon to stir until a soft dough forms. Remove the cookie sheet with the Nutella centres from the freezer. 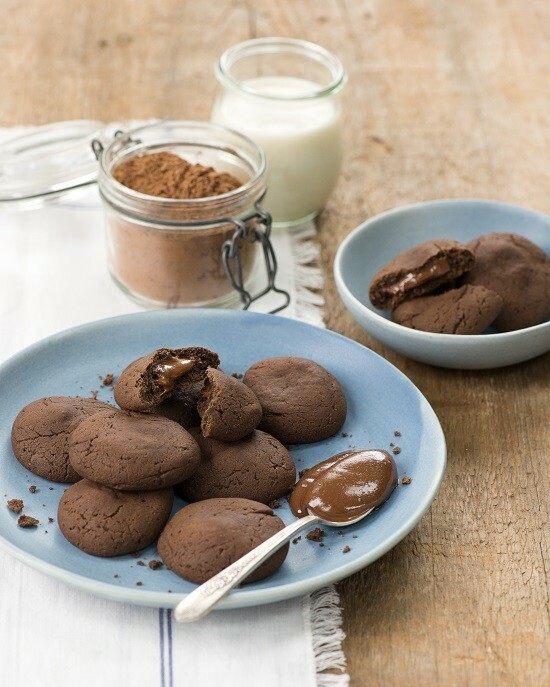 Scoop a level tablespoon of chocolate cookie dough, roll into a ball and flatten into a thin disc in the palm of your hand. Place a Nutella ball in the centre. Fold the sides of the chocolate cookie dough up and around the Nutella centre and gently roll into a smooth round ball between your palms. Place on the cookie sheet and repeat with remaining dough, placing the cookies about 2 inches apart. These cookies will spread while baking, so do not flatten them. Bake cookies for 10 minutes. Remove from the oven and allow to cool completely. 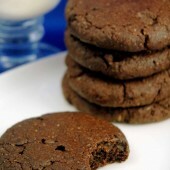 Store cookies in an airtight container at room temperature for up to 5 days, or in the freezer for up to 1 month. NOTE: To make these cookies gluten-free, replace the all-purpose flour with 3/4 cup gluten-free oat flour plus 1/4 cup tapioca starch. The dough will be wet, so refrigerate the entire bowl of dough for 15 to 20 minutes until thick enough to roll. Wow, I NEED these in my life. They look amazing. Woodrow just peeked over my shoulder and said in his most serious voice, “Mama. We NEED to make these.” Looks like this might be his birthday treat getting sent into school with him tomorrow! Yummy these cookies look so fantastic I wish I could just reach through and grab one out now! Glad to hear your move went well. Housing is so crazy in Toronto! Coconut oil is also one of the healthiest oils to use when cooking. I liked the recipes cooked in coconut oil. This looks fantastic in pictures. So delicious and almost caramel. I bet the taste is out of this world! that’s I am going to try this in the weekend. Thanks for sharing!